1. Don't go by the Titles of these Life Hacks. You will always learn something from a Life Hack. 2. Listen to them regularly. Each time you listen to them in a newer energy state, you derive newer and better meanings from the same Life Hack. simply visit a YouTube video conversion website, and download it. It's all yours. ♦ Don't Worry. Be Happy In The Present. ♦ Making an Important Decision? Just wait for One Minute! ♦ What are you tending to? ♦ Don't Worry. Discipline yourself. ♦ Are you SUFFERING from FoMO due to WhatsApp / Facebook / Twitter / Instagram? ♦ Is EGO bad? Can it be beneficial to us? ♦ Don't exaggerate problems. Be an Ant-Man. ♦ What exactly is EGO? ♦ Is SELF-LOVE the sign of SELFISHNESS? ♦ Do NEGATIVE people affect our POSITIVITY? ♦ Don't want to marry but being forced to? ♦ How do I expect / imagine my life-partner to be? ♦ "My husband is not loyal to me, I want to commit suicide"
♦ Thanks, to Patanjali. My Acidity is cured forever! ♦ Why Visualize as the first person and not the third? ♦ The Law of Karma - Simplified! ♦ Can Good Karma nullify Bad Karma? ♦ Depression - Simplified. Cure it in 3 mins. Everything is Law of Attraction, and creating this section was tricky, but I've tried to segregate Life Hacks into this section anyway. ♦ Spirituality is about Letting Go. Are you on track? ♦ Life is a Blessing. Live it that way. ♦ Do humans reincarnate as animals? ♦ Why do we Judge people? ♦ Everyone has problems with everyone. Where do you choose to be? ♦ How are you coming across to the Universe? ♦ Are you being ARROGANT on your Spiritual Journey? ♦ Do we use the phrase 'Nobody is perfect' correctly? ♦ Is there a STAGE one can reach when one never feels NEGATIVE? ♦ You Have The Power. Start Using It. ♦ Don't Make All Affirmations Daily. Recognize Your Energy. ♦ Does the Tense of your Affirmations matter? ♦ Are you misusing the Law of Attraction? ♦ How Specific should Your Desires Be? ♦ Should you thank the Universe or yourself? ♦ How much should you THINK about your DESIRE before it MANIFESTS? ♦ What does ACTIVATING the Law of Attraction mean? ♦ How SOON does the Law of Attraction MANIFEST your DESIRES? ♦ Why ATTEMPT a SUICIDE when you can do this? ♦ Can you MANIFEST more than ONE THING at a time? ♦ How can you become spiritually elevated? ♦ Is Repetition necessary to Manifest your Desire? ♦ Is 26th a Bad Omen or Are we Subconsciously Attracting Those Disasters? ♦ I was Positive, then Why did this Negative Incident Happen? ♦ "Will Evil Eye affect me and my baby?" ♦ "Can someone else manifest something for me?" 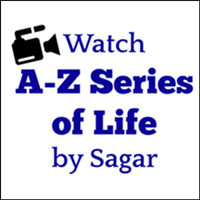 ♦ What would Sagar recommend?